I just saw a beautiful photograph of a full, bright, rainbow by a friend going through very difficult times. Thus the rainbow has its ends within yourself…. So the pot of gold is there too. There will be more swans. It has been a beautiful day, here in Wolverhampton, cool but with hints of Spring beginning in the bright, hazy sunshine. It’s a Sunday to bring the families out and, sure enough, as I write this later in the day, the park is crowded with people of all sorts, their dogs, bikes and other toys, enjoying themselves in a relaxed way with a feeling of ease and relief after a chilly Winter. 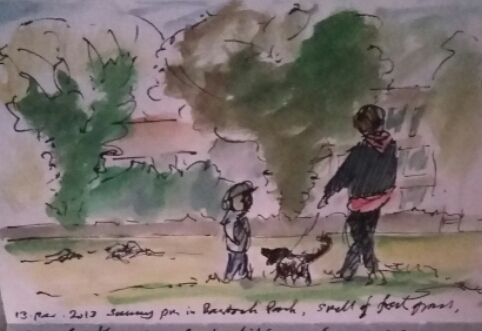 As I sat on a fallen branch, making quick sketches, the air was full of scents of cut grass, ground coffee (I had just bought some from a stall), cool air. Cries and barks of children and dogs, above the hiss of passing traffic, were interspersed with a periodic distant roar of football fans in the Molineux Stadium. Early this morning, I went to the Central Baths to have a swim while the pool would normally be used only by a handful of distance swimmers. There was a Gala on today, so it was closed. 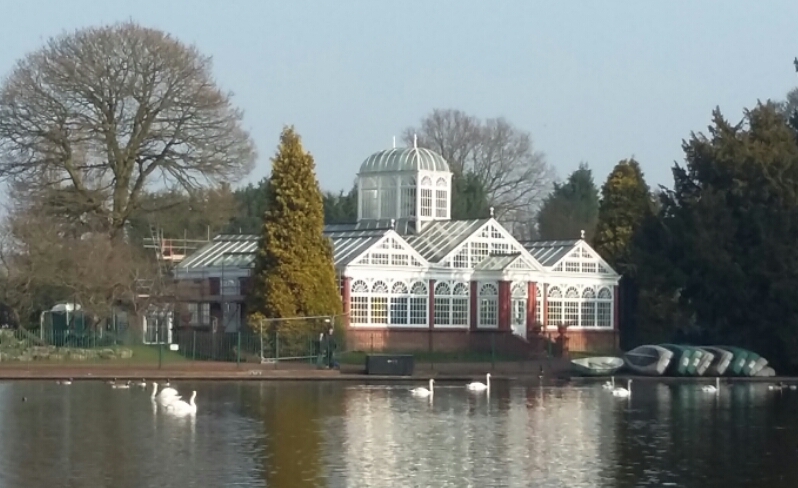 So I cycled slowly around the green calm of West Park, watching the birds on the lakes. The swans were gliding, displaying and courting, a pair was deeply engaged in a graceful dance of dipping their heads in the water and crossing each other’s necks. They mated, quickly and quietly, the male submerging the female briefly, then both surfaced and together made a grunting honking sound I have not heard before; I think they were mutually satisfied! I returned to the flat for breakfast before deciding it was too good outside to stay indoors. It has been a lovely day, and there will be more swans this year.